It lasts 30 minutes, and it's a half hour very well spent. Generally I prefer to read transcripts (find one here), but if this should be your first encounter with the recording, do pick the video. It fairly crackles with the electricity of two powerful intellects in combat. With a couple of exceptions, Mike Wallace gave her no quarter, and no interviewer of the last half century is known to have been more aggressive. Had I been sitting in Ayn Rand's chair, I'm quite sure I'd have melted, from the ferocity of his questions. But she did not; although this was her first TV appearance, the only sign of nervousness was a curious movement of the eyes. Otherwise she was relaxed and cool and gave every bit as good as she got, with crisp, emphatic and arresting replies. Let's get the exceptions out of the way: Invited to explain her philosophy, Ayn replies, “First, my philosophy is based on the concept that reality exists as an objective absolute” and Mike Wallace does not challenge or question that; he might have. More on this below. Given that he was being hostile (in a polite way), that omission is amazing. I wonder why he missed it, and can suppose only that to him, government is so much a “given” that it just didn't occur to him that someone has to pay its expenses. Perhaps, like many on the Left, he really supposed that its costs are met by plucking fruit from the money trees that grow on the National Mall. Whatever; but he lost a huge opportunity to skewer his guest, for I have no idea how she could have answered him. She was really caught in what she so frequently exposed and castigated: a logical contradiction. Nobody is so foolish as to pay for government without force, and she had just correctly described force as morally evil, so she seems to me to have placed herself between a rock and a hard place. Yet Wallace let her escape. Those are the exceptions, though. Elsewhere, Mike Wallace gave her a hard time and she answered him brilliantly, and I'll leave to the reader to enjoy them all and learn, with me, how better to respond to our statist adversaries. Here, I'd like to focus just on the very first issue raised: reality. Ayn Rand based her philosophy on “the concept that reality exists as an objective absolute” and that has been simplified that to the axiom “A is A.” A is not Non-A, its logical opposite; and A is what A really is, not what the spinners may say it is. Ayn Rand's stated “reality exists as an objective absolute” says much the same but more elegantly, and Descartes' cogito ergo sum (I think, therefore I am) puts it more succinctly. Too bad the converse (I am, therefore I think) doesn't necessarily hold. The alternative, which takes many forms, is solipsistic; that is, that the world and other minds do not exist (so, Wiki.) The apparent assumption that “other” minds do not exist while one's own mind does exist, is breathtakingly arrogant--and the whole is fundamentally silly. This is the kind of nonsense into which one rapidly descends after denying reality. The fact that reality cannot be proven results from there being no more primitive premise to use in forming such a proof. It is an axiom; any attempt to refute it explicitly requires implicit acceptance. "Reality, the external world, exists independent of man's consciousness, independent of any observer's knowledge, beliefs, feelings, desires or fears. This means that A is A, that facts are facts, that things are what they are—and that the task of man's consciousness is to perceive reality, not to create or invent it." Thus Objectivism rejects any belief in the supernatural—and any claim that individuals or groups create their own reality. That is an elegant starting point for all rational thought, and it's vitally important to think only in rational, economic terms instead of political and/or superstitious ones. The alternative to rational thinking is intellectual vegetation. Thinking rationally leads rapidly to a correct understanding of what human beings are, what government is, how markets work and what ethics are good to follow in life; rational ethics, neither ones that are relativistic, like those prevailing today, nor “revealed” by a mythical engraver of stone tablets. 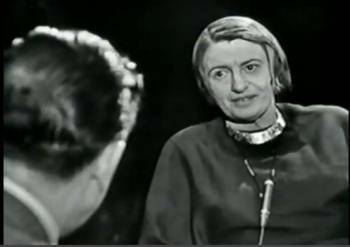 As shown above in relation to her tolerance for a “limited government,” Ayn Rand sometimes failed to follow her own principle, for government is never other than a fictitious entity; but the principle itself deserves nothing less than full endorsement. Nicely done, Jim, as usual! Just as a point of curios, while I will agree with the Objectivist disbelief in the "supernatural," I wonder what their reaction is to the "paranormal"? The distinction being that the former is pure fantasy -- there can never exist anything which entirely defies any and all laws of scientific nature -- while the latter describes phenomena which does not. Alex, I hadn't thought to list tales of ghosties, ghoulies and things that go bump in the night very high in any extension of the above table of common myths of which our neighbors need urgently to be disabused. On the other hand, the subject of the paranormal is interesting as an exercise and illustration. Dictionary.com defines it as “the claimed occurrence of an event or perception without scientific explanation” and if that's correct, I'd say the paranormal is not real. If it cannot be observed, measured, replicated, theorized about and re-tested, it ain't part of reality. On the other hand, the rational enquirer will not rush to judgement. He will try to move the claimed event into a condition where it can be measured, etc. The story of science is one of mysteries that have been solved, in such a way. If and when that can be done, the “para-” prefix may be dropped and we'll have a new component of the real world. If you're right in saying that it doesn't entirely defy natural law, you may be the one to move it. Jim: The point you raise was precisely the distinction I was trying to make -- unfortunately at the time I typed that, I had to rush away from my desk quickly...on wholly non-paranormal business. :-) But I am in no such rush now, and I suppose I was mostly pointing out an aside about word choice. "Supernatural" is an impossibility by virtue of the very term itself. Whereas "paranormal" connotes that which is outside the realm of routine experience entirely, but which may still possess a rational scientific explanation, even if it is one far beyond the reach of currently known or even hypothesized phenomena. Of course, in my view, it could be none other -- even if the science involved does not directly appertain in any way to that which applies in our universe. Increasingly, reputable and valid scientific study of the paranormal is becoming acceptable practice. I think that's a good thing. That's a very good story you wrote, Alex, I'm sorry to have missed (or forgotten) it first time around. It would be amazing if intelligent life did not exist in other part(s) of the universe, so if this planet gets a visit now and again I see nothing in it to challenge our understanding of reality or a rational process of examining the evidence. The difficulty may be in pinning it down for examination, replicating the observations etc. All compounded by the way governments try to keep evidence under wraps. "If it cannot be observed, measured, replicated, theorized about and re-tested, it ain't part of reality." This is a facinating topic, I'm glad you wrote the piece. I have a few a few issues to raise in the interest of keeping some activity going over the holiday break. That is a curious definition of "reality", and one that appears to be in contradiction to your A=A postulation. If reality is "really real" as you claim, then it does not require observation to be "real". The tree that falls makes a sound, observer or no. Or it doesn't. You can't have that both ways: which is it? Indeed, according to that observational based definition the very bones of matter and the universe "ain't part of reality." Gravity itself cannot be observed-only its effects, weight and acceleration, can be, it cannot be replicated, and while it's certainly theorized about, its existence is still an utter mystery. In fact, it really has not even been truly defined. Yet without it, nothing "exists" at all. By the way, what he is talking about is NOT solipsism...he's discussing the basic functions of physics. He is not making a philosophical point, but rather a mathematic one. In any event, is not the basis of your (and Rand's) philosophy "human nature" rather than "reality?" Anyway, I hope everyone has a chance to enjoy family and friends over the holiday. I'll stick with that definition of reality. Please note, it's in the passive voice: "If it cannot be observed..." You're quite right, there are many things that are real but which are not visible, including that famous tree in the forest; but that tree can be seen to fall. It's just that nobody was around when it did. Gravity, likewise, can be perfectly well "measured, theorized about, tested..." To a more limited exent, so far, so can other real but invisible things like emotions. They too are real. So is human nature. Over lunch, Mike, I thought of an entity which is not a good fit for my definiiton of reality; so I offer it to you here in a spirit of sportsmanship. It's the square root of -1. In mathematics, there is no number which, when multiplied by itself, can produce a negative result. Therefore, the root of -1 is imaginary, often designated "i" - even though it's useful in many equations (I forget which, it's been a while) and can be reasoned about and tested. So is it real, or not? On the knife-edge, obviously, analagous to the once-vital question of how many angels can dance on a pin-head. That will engage a certain type of mind for a long while, but meanwhile I suggest we focus on the large array of important fables such as those tabulated in my article, which Boobus Americanus falsely imagines to be real. Always great to review the fundamentals of rational thought. Having finished all 3 parts of the Mike Wallace interview I got caught up in watching a 1979 Phil Donahue interview -- not long prior to Ayn Rand's death. It was an hour more or less, and of course I ended up whiling away much of the day with that and other "surfs" resulting therefrom. I've been television-free for nigh onto 40 years now, so I hadn't seen them. Take that back, I think I saw parts of the Mike Wallace interview on the compooter once. For some reason I liked Donahue's dialogue better. For one thing he opened it up at the end to questions from the audience, and I gained much more respect for both Rand and Donahue after watching how they handled the exchanges with the members of the audience and with each other. On another clip with Donahue, at 5.00 a young lady got up to challenge her. At first I was moved to "feel sorry" for the poor gal. Because Rand interrupted (I thought quite rudely) and shut the girl down without listening to her question. After analysis I gained much respect for Rand. She simply refused up front to deal with intellectual blackmail. You'll have to watch to see my point. Would that I develop that level of assertiveness in my dotage. I agree with you, Jim: Ms Rand was definitely mini-statist. But so were many of our "mentors" from her period, before anarchy became a factor other than a bad name. And I also agree totally with your final equation: "Anyone who is limited does not govern". Nobody will ever use decent stewardship of others' produce ("money") if or when it is extracted by force under threat of violence. "Limited government" is a pipe dream. Late to the game, but Sam. Thanks for your closing remark. I guess I would have said "Limited government is and opiate pipe dream". Our culture has become so degraded, so lowered to a form which 'entertains' the lowest common denominator that such a discussion between two people about abstract values for half an hour would be unthinkable for broadcast by studio executives. Good thought, Entito, which I had missed. It's certainly true that nothing in recent memory compares to this interview, treating as it does some fundamental questions of philosophy. Whether that's because the current American audience could not relate to it, or because studio execs are systematically excluding such radical ideas from what they permit to be broadcast, is a different question. I fear it might be the former, but will persist in supposing it to be the latter. My slender rationale is that PBS (though no, not NBC) does put on some quite stimulating "think" programs occasionally, such as "Intelligence Squared." They don't get to the root of the matter, but they do dance around it.